Oil on paper, size A3, Palette Knives, 2014. This boat found tight to a rope during high tide at a nearby jetty near Kuah Town in Langkawi, Malaysia. It started raining and I tried to capture that moment using a cell phone. Hi, i'm SaadonSaad from Malaysia. Here you can view my paintings mostly done in oils. For now my great interest is painting oils on canvas boards and I loved to create them using palette knives as you can see most of them were using knives. Brushes shall be used when there were something very detail needed in some areas to complete each paintings. 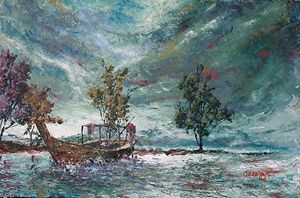 Paintings is my hobby during my leisure times and hope that everybody who came to this site can enjoy viewing my arts as I created them through my everyday observations and experiences. If you'd like my paintings and either to buy originals or prints, there's always a link that you can follow. Again, thank you very much for your kind attention at my creations.